NORTH KOREA, PYONGYANG - July 24: Mansudae Monument at July 24, 2014 in Pyongyang, North Korea. 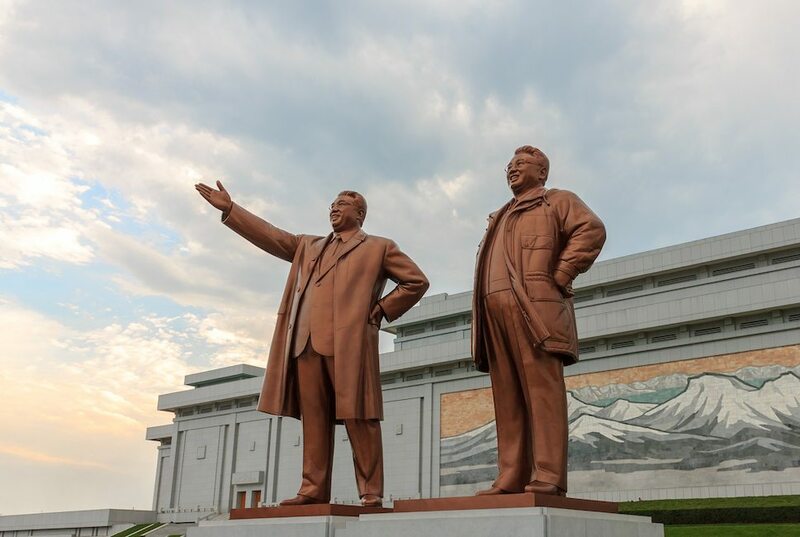 Mansudae is the most respected monument of the late leaders of the DPRK. It was my fourth day in Pyongyang, and I woke up at 5:30 to the first signs of sunrise. I decided to go for a jog to escape the stifling dry air in my hotel room. I left my room on the 31st floor and pressed the button for the elevator. As I waited for it to creak up from the lobby, the power suddenly shut down and brought it to a halt — luckily, before I had actually entered. The hotel’s backup generator kicked in a couple of minutes later and it continued its journey upward. After finally descending, I made my way past a couple of snoozing minders who were escorting a delegation of Russian military officials also staying in the hotel. No one protested my unilateral move to the street, so I went ahead on my own. My route took me down a normally busy avenue that was deserted at this early hour, and past the central railway station. People were already streaming from the station, many of whom were passing a giant ‘jumbo-tron’ screen that was broadcasting old Korean war movies for the entertainment of those travelers waiting to catch their bus connection. As I continued my run, I reached the banks of the Taedong River, which bisects the city. Hundreds of young uniformed ‘soldiers’ (I use quotation marks here since the average age seemed to be around 14) were lining up for morning formation. I turned to follow a bike path that parallels the river, and by now the sun was poking above the horizon. A thick fog had set in, and I could barely make out the giant Yanggakdo International Hotel on a small island to which most visiting foreign tours are relegated when they visit. A group of middle-aged women were doing tai-chi on the riverbank, and some old men were fishing from a small bridge. The most remarkable thing about this run, and my impromptu encounter with Pyongyang’s morning commuters, was their reaction when they saw me – which was to say, no reaction at all. Imagine if you were walking through your hometown, and an eight-foot green Martian suddenly emerged from a corner and ran past you. I’m guessing that you would feel the same sense of surrealism that these North Korean commuters likely felt when a six-foot American in Nike shorts and a bright blue shirt jogged past them in downtown Pyongyang. But invariably, their reaction was to avoid eye contact and pretend that nothing unusual was happening. There was an exception to this, of course, and that was the children. The kids that I encountered on my morning run stared, and pointed, and often smiled. I waved and smiled back. I went for a run on every morning of my visit, primarily because it was my opportunity to move around the city unimpeded. I succeeded on every morning save one. While at dinner on our third night, two of our group informed our host of our intent to go for a morning run at 5.30am. He suddenly became motivated and announced that he would join us. Sure enough, he was waiting when I entered the lobby the next morning – wearing the same clothes and Oxford shoes that he had worn to dinner the night before. Bemused, but saying nothing, we joined him on the street and watched as he proceeded to run. We followed along, and continued for a couple of miles before he stopped and lit a cigarette (the first of what would be about three packs that he burned through that day). It became readily apparent that the running segment of our outing was over. MOST WORLDLY PEOPLE wouldn’t believe that Pyongyang has a viable property market. But here we were, on a cold and clear morning, reviewing the quality of construction on the roof of a four-story building in the central neighborhood of Pyongchong . Until recently the concept of private property ownership was unheard of, and is still taboo. 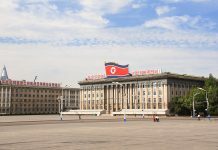 The state provides a place of residence to all government employees – in other words, to everyone – in Pyongyang But in the past couple of years it’s become common practice for residents to sell their ‘right of residence’ to other North Koreans in return for cash (dollars or renminbi, naturally). The system works well for the newly minted donju, or oligarchs, who want a riverfront view, or to live closer to their workplace or children’s school. While foreign ownership of residential property in Pyongyang and most of the DPRK remains forbidden, we heard that some adventurous Chinese businessmen have established nominee relationships with property owners. They effectively ‘own’ flats in the city that they are able to sell for profit in a rapidly appreciating market. Recent media reports indicate that some city center residences are selling for as much as $200,000. We visited several building sites throughout our stay, most of which were high-rise residential buildings of twenty stories or more. The sheer number of these projects reminded me of Dubai ten years ago. Watching the building work, I couldn’t help wondering just how sound the construction is. Many of the workers are doing second jobs in the growing ‘shadow’ economy. The government issued a rare statement of apology when a fully inhabited 23-story apartment building suddenly collapsed in 2015. No one knows how many were at home, but insiders estimate that up to 400 died in the disaster. To be fair, the building materials on hand appeared of reasonable quality to a layman like me. And, while a health and safety inspector might have been appalled at some of the contraptions these workers were using to do their jobs, they didn’t appear significantly different from building sites I have seen in other Asian frontier markets. In central Pyongyang, apartments are being sold for $300 to $500 per square meter, which is about half the cost in Moldova, Europe’s poorest nation. We observed one building site where two units were for “sale”; the available floor area was 80 to 100 square meters, with prices ranging from $25,000 to $45,000 per flat. The four-story commercial building in the central Pyongchong region that I mentioned was previously priced to sell at $180 per square meter. But construction had never advanced because the “seller’s” capital had been depleted. We made a conservative estimate that it would take another $500,000 to finish the job. Nevertheless, as I stood from my vantage point on the roof, I counted five cranes within this central neighborhood – all of which were working on high-rise apartment towers. Given the paucity of basic amenities throughout most of Pyongyang, my inclination was that a restaurant or market would ultimately do very well there. Demand for homes in and around the city center very clearly outstrips supply. We were shown a suburb several miles outside of central Pyongyang where the government intends to build 65,000 housing units from January. And there’s another sign of creeping capitalism: the arrival of trading companies and real estate agents setting up in response to lucrative opportunities. Brokers have started advertising available housing units on the Kwangmyong, or national intranet. Of course, the Intranet is heavily monitored. We were told that the regime is not yet comfortable with this phenomenon, and a handful of brokers who advertised their services too aggressively have been arrested. Yet the practice continues, even though prudent agents are keeping a low – and largely off-line – profile. Beyond real estate, many international companies are entirely overt. It’s a popular misconception that sanctions from the U.S. and other governments prohibit any business being conducted with, or within, the DPRK. While official guidance from the U.S. Treasury forbids any import of North Korean goods, there’s not a blanket ban on exports. Beyond the predictable restrictions on arms-related exports, business with entities on the Treasury’s black list and “illicit economic activity” (read: money laundering or drug smuggling,) the rules become a little fuzzy. Trade in “luxury goods,” for example, is off limits, though just what defines luxury is open to interpretation. Louis Vuitton handbags? Swiss chocolates? Organic cat food? Your guess is as good as mine, and this is undoubtedly an intentional tactic on the part of the Treasury to minimize commercial activity. Along with untold numbers of mostly Chinese manufacturers outsourcing labor-intensive functions to North Korea from textiles to IT, Western names are also here – like the global shipper DHL. 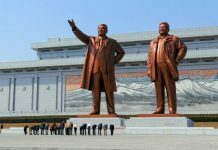 The Swiss pharmaceutical giant ABB has maintained an office in Pyongyang for over a decade, and Koryolink, North Korea’s telecom network operator, is a joint venture with Egyptian-owned Orascom.